Mike van Green is an award-winning writer of note and deservedly so. He’s provocative, pulls no punches, has his finger on the pulse of South African politics and is not afraid to state his opinions. I first saw his Green Man Flashing some years ago so was looking forward to its revival which had performances at the 2018 Hilton Arts Festival. I wasn’t disappointed. Directed by Malcolm Purkey with set and lighting design by Denis Hutchinson, it featured an excellent cast comprising Michelle Douglas, Kate Liquorish, Litha Bam, Sechaba Morojele and David Dennis. The title of the play makes reference to the sign at traffic lights or pedestrian crossings indicating that it is safe to walk across the road. But the problem is – if there is a vehicle hurtling towards you, do you stop ... or obey the green man, ie authority? 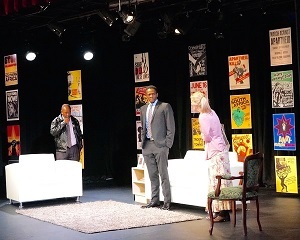 The set comprises panels of anti-apartheid-themed posters behind a white settee and armchair. The play is set in 1999, six weeks before the country’s second elections, and moves through flashbacks and current scenes which challenge one’s focus but add to the dramatic value. Gabby (Michelle Douglas) is a personal assistant to a black government minister. She was married to Aaron (Litha Bam) who works for the ANC in a high-profile protection capacity. The play picks up where she claims she has been raped by her boss who has an impeccable track record and this situation would cause considerable political repercussions should it become public. Aaron tries to dissuade her from revealing her situation and offers a job outside of South Africa anywhere in the world at any of the embassies in return for her silence. However, her friend Anna (Kate Liquorish) who is also a lawyer, doggedly urges Gabby to stick to her guns and go ahead. Also in the picture are Inspector Abrahams (David Dennis), an apartheid-era cop, and Nasty Luthando (Sechaba Morojele) who is another VIP protector. Luthando threatens Gabby and the upshot of the argument is that he is shot dead. Whose fault was it? This is explored through Anna’s cross-examination of Abrahams in court. The great thing about the Hilton Arts Festival is that it gives discerning KZN theatre audiences the opportunity to see artists of high calibre such as these. “Green Man Flashing” is now a prescribed school text work.